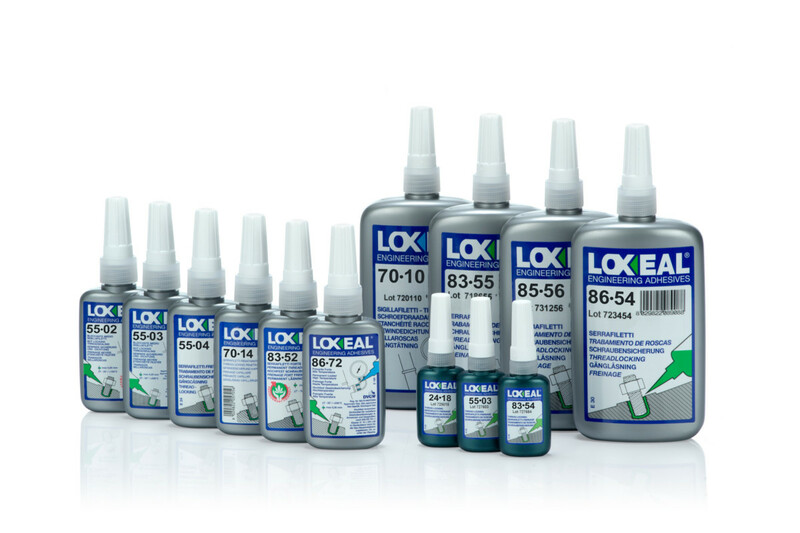 Threadlocking Anaerobic Adhesives | Loxeal S.r.l. Prevent loosening caused by vibration, mechanical and thermal shock. Low strength anaerobic adhesive for thread locking of nuts, bolts and screws of all types that require to be easily desmantled. Highly resistant to heat, corrosion, vibrations, water, gases, oils, hydrocarand many chemicals. Medium strength anaerobic adhesive for thread locking of nuts and bolts of all types requiring to be dismantled. Highly resistant to heat, corrosion, vibrations, water, gases, oils, hydrocar¬bons and many chemicals. Medium strength anaerobic adhesive for thread locking of nuts and bolts of all types that require to be dismantled. Suitable to be used on oily surfaces. Highly resistant to heat, corrosion, vibrations, water, gas, oils, hydrocarand many chemicals. Proven unscrewing resistance at +200°C. Approved as gas-tight sealant for threaded fittings according to the European norm EN 751-1 (DVGW nr. NG-5146AU0399 and GAZ DE FRANCE). Approved for potable water (TZW – DVGW). It keeps sealing properties unchanged between -55°C/+200°C and up to +250°C for short times. Medium strength anaerobic adhesive for thread locking of nuts and bolts of all types that require to be dismantled. Highly resistant to heat, corrosion, vibrations, water, gas, oils, hydrocar­bons and many chemicals. Medium viscosity anaerobic adhesive for thread locking of large diameter studs, nuts and bolts of all types that require to be dismantled. Highly resistant to heat, corrosion, vibrations, water, gases, oils, hydrocarand many chemicals. Low viscosity and high capillary action for locking and sealing threaded fasteners and close fittings parts after assembly, also to penetrate and seal metal porosity in moulds and in castings. Medium to high strength locking. Highly resistant to heat, corrosion, vibrations, water, gases, oils, hydrocarbons, and many chemicals. High strength anaerobic adhesive for locking and sealing of studs, nuts, bolts and threaded fasteners not requiring dismantling. Highly resistant to heat, corrosion, vibrations, water, gases, oils, hydrocar­bons, and many chemicals. High strength anaerobic adhesive for locking and sealing of studs, nuts, bolts and threaded fasteners not requiring dismantling. It can be used on all metals, either in free or forced matings. It provides temperature resistance up to +200°C and high unscrewing strength. Highly resistant to heat, corrosion, vibrations, water, gases, oils, hydrocarand many chemicals. High strength anaerobic adhesive for locking and sealing of studs, nuts, bolts and threaded fasteners not requiring dismantling. It can be used on all metals either on free or forced matings. It provides high resistance to heat, corrosion, vibrations, water, gases, oils, hydrocarand many chemicals. High strength, fast curing anaerobic adhesive for locking and sealing fitted parts. Highly resistant to heat, corrosion, vibrations, water, gases, oils, hydrocarbons, and many chemicals. High strength anaerobic adhesive for locking and sealing thread connections. Very high temperature (+230° C) resistant, high strength anaerobic adhesive for locking and sealing thread connections and fitted parts. DIN DVGW approved thread sealant for gas (according to DIN EN 751-1 Reg. Nr. NG – 5146AT0264).